Irving K. Barber Learning Centre will be open on Monday, October 13, 6am – 1am. Image Credit: Detail from Autumn Leaves by Cornelia Kopp, used under a CC by 2.0 License. UBC Library and the United Way teamed up for the fifth annual Spelling Bee, which took place Tuesday, October 7 at the Irving K. Barber Learning Centre. The hour-long event culminated in crowning this year’s winning team: UBC Hive Minds (Ann Macklem, Alexa Love, Megan Malashewsky, Megan Brand, Lesley Erickson, Valerie Nair, Murray Tong, Nadine Pedersen), from UBC Press. 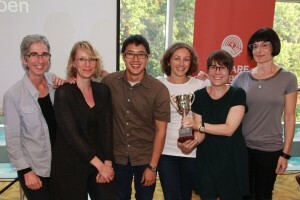 UBC Press’s team, Hive Minds, won the 5th annual Spelling Bee. 16 teams competed for glory, with an unprecedented four-way tie for second place: The Lexicons (Ceremonies and Events), Bombeez (Building Operations), former Bee winners the English Exoterics (English Department) and Spell Library (UBC Library). The cross-campus team competition to raise awareness for the United Way featured words such as sesquipedalian, syzygy and acetylsalicylic.